Baby Beluga is lyrically complex and fairly long, so if I sing it at storytime I’ll try to print out song sheets. Though it’s such a beloved children’s song (dating to parents’ childhoods now), that there are always a handful of folks who don’t need it. I’d never thought of Take Me Out to the Ball Game as a storytime song, but colleagues of mine have convinced me otherwise. As only the chorus is well known, that’s all I’ve included here. Song credits belong to Jack Norworth and Albert Von Tilzer from 1908. I learned These are the Toes of My Baby way back in library school, and have sung it at many happy baby and toddler storytimes. It’s tickly and playful, and makes everyone smile. Jbrary has it too, if you’d like a little inspiration. Take Me out of the Bathtub is from one of Alan Katz’ books of humorous piggyback songs. The complete song is longer than I would use at storytime so this is just the first verse, but you can listen to it all here. These chords are slightly simplified from the Bytown Ukulele songbook. You can also play in A or C, or ignore the 7s if you prefer standard chords. Take Me Out of the Bathtub! Take me out... I'm clean! My wonderful colleague Els reintroduced me to this classic Ella Jenkins song. It’s quick to learn, participatory, highly adaptable and very catchy. Perfect for storytime. You can listen to a sample of it here. Or check your library collections. Everyone should have some Ella Jenkins; she’s an institution. You can sing this as an action song, a daily activity song, an opening/closing song, or whatever else you might come up with. Els worked out these chords in C. I’m including a 3-chord F version as well for those (like me) whose vocal range is reduced by endless winter colds. It sounds better with that 4th chord, but I can’t bear to fumble with a B during storytime. Love Me Tender isn’t one of my usual storytime songs, but it would be a fun one to try. And I do have two sweet variations on the tune. Dennis Lee‘s Rock Me Easy is one of my favourite lullabies for babytime. When I sing it, it soothes me too. 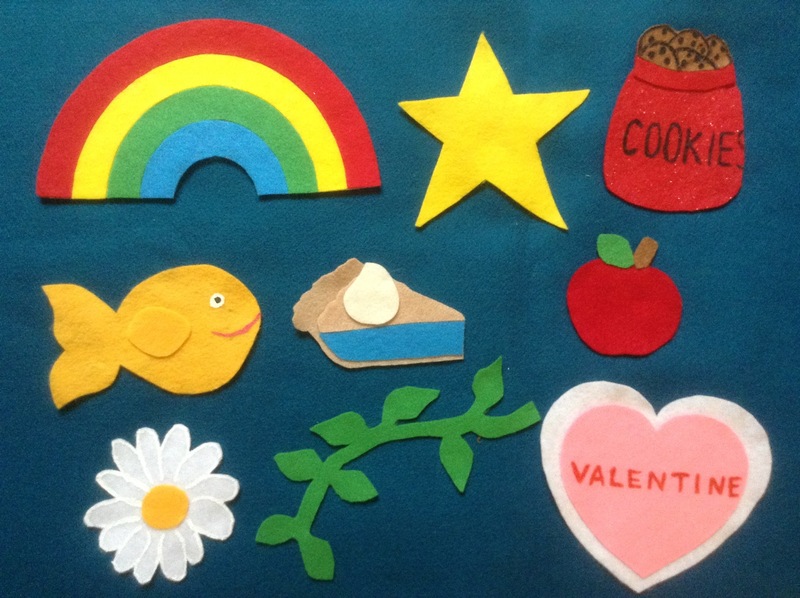 I’ve only recently learned You’re My Rainbow from my colleague Kelly, and I patterned most of my felt story on hers (which she in turn received from another children’s librarian [thanks Tess!]). The pie and rainbow are the exceptions, based on Open Clipart images. Love Me Tender is by Elvis Presley and Ken Darby (who is sometimes credited as Vera Matson), and I’ve found the chords in a number of different keys. C was the easiest for me this time, and although I’ve simplified it slightly it’s still a little trickier than most of the songs I post here due to the key change in the middle. If you don’t like that E7, you might want to try playing in F (as posted on Doctor Uke). This is the third in a series of love-the-littles songs. If you only sing one holiday song at your storytime, it’s likely to be Jingle Bells, so here’s a nice simple version that I expect will be getting a lot of play in my own programs this month. If you prefer to play your songs with 3 chords or less, you can skip the D7. I assure you, the kids won’t notice. And if you’re feeling playful, try Walter Minkel’s delightfully silly Jungle Bells. I’ve been meaning to play this one at my own storytimes for ages, and this might just be the year for it. Jingle Bells is such a perennial favourite that we often forget to credit it, but I’d like to note that this was written in the 1850’s by James Lord Pierpont. This beauty of a folk song was written by Elizabeth Cotten and first recorded in the 1950s. There are plenty of different version and verses, my favourite being the Elizabeth Mitchell cover. I love how she invites destination requests from her audience. I tried this at my own storytimes this week, and the kids wanted to visit China, America, Africa, and “The City.” In the end, our only “problem” was too many places to see. I guess we’ll just have to play it again next week. At home with my own two-year-old, we also sing about the different types of public transit we take (skytrain, sea bus, trolley bus etc), and he loves it so much he’s started to make up his own verses.